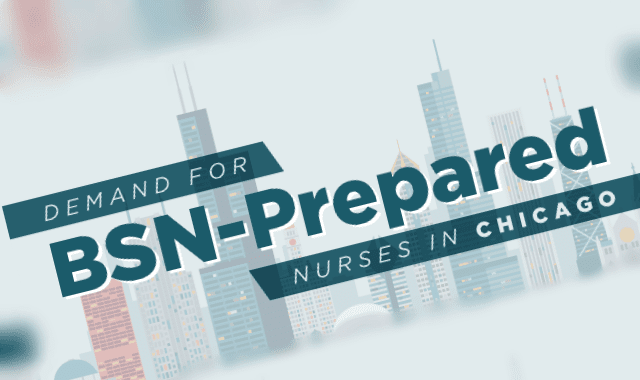 Demand for BSN-prepared Nurses in Chicago #Infographic ~ Visualistan '+g+"
This infographic is promoting the BSN degree in Chicago and the surrounding area, but is relevant anywhere as it is promoting getting an Online BSN degree and states that as a whole the nursing profession continues to experience rapid growth. It includes statistics related to being a registered nurse and the job workforce as well as hospital statistics. It's specifically advertising the Online BSN program for Aurora University Online at the bottom, stating that employers prefer the flexibility, critical thinking skills and leadership skills that BSN-educated nursing staff can provide. It states that specializations are currently in demand for nurses, and that there are several areas nurses can target with their education, training and experience. This infographic was posted recently on March 11, 2018 to the Aurora University website blog.